Bullfighting keychains There are 24 products. 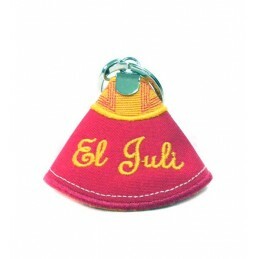 We have a huge variety of keychains, Keyrings, Key holders with bullfighting motifs, capes, bullfighter’s jackets, caireles, bull breeder brands, monteras, banderillas and more made from many materials including cape cloth, leather metal etc. They are an ideal gift or souvenir for fans of bullfighting, bullfighting schools, and breeders. Distinctive element in livestock, comprising colored ribbons, attached at one end, which is stuck in the rubble of the bull in the pre-departure time the square, to be dealt. Made in Spain. 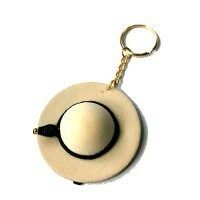 Capote keychain made in leather with an embroidered esclavina. In fuchsia and yellow colors and a measuring approximately 2.9'' x 3.1''.Spanish gift ideal as a souvenir or for fans of the bullfights. Bullfighting keychain with machos. Available in black and gold. Hand made in Spain from bullfighter tailors.Did you know...?…the machos are tassels that are used to adorn the jacket and the pants of the bullfighters. They are made by bullfighters tailors and they are highly appreciated by the fans when the bullfighters come out on shoulders? Ranches rosettes keychains, ZiNGS unique design. Handmade in Spain. Perfect for ranchers, clubs, bullfighters, etc.Measure: 3.5'' in diameter and 10.9'' long, without the ring.VERY IMPORTANT: make sure the combination of colors is what you want and if you have. 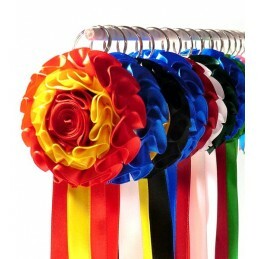 Ranches rosettes, intertwined handmade with satin ribbons and ready to be used askeychain. Is a unique design from ZiNGS. Perfect gift for: breeders and clubs. Made in Spain.Measures: 1.6 diameter, 3.9'' long without ring.VERY IMPORTANT: make sure the combination of colors is what you want and if you have any questions, contact us. Capote fabric bullfighting keychain, embroidered with the names of fighters: José Tomás, José María Manzanares, Morante de la Puebla, El Juli... and others. 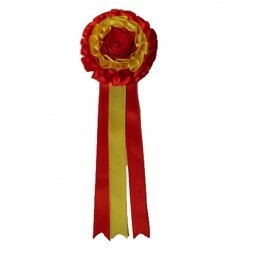 Ideal gift for clubs or bullfighting schools. Made in Spain. 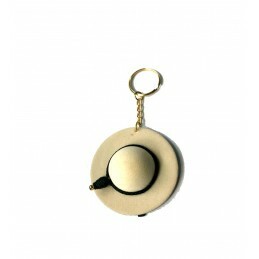 Size: 2.3'' long x 2.5'' wide, plus the keychain ring. 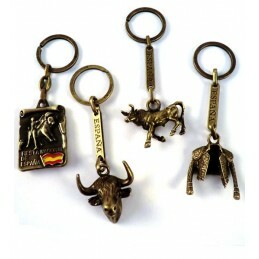 Selection of copper colored key rings with bullfighting motifs. Choose the one that best suits to your interests: bull's head, Fiesta Nacional (National Holiday), Las Ventas or suit lights jacket.Measured about 3.3-3.9''. Click on "More details" to read something important.